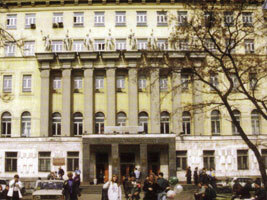 Moscow State Mining University (MSMU) was founded in 1918. MSMU is a major centre of professional education of Russia and its capital, with the total number of 5500 students. The University offers a broad spectrum of academic programs leading to Bachelor’s, Master’s, Doctoral and professional degrees. The Moscow State Mining University prepares doctors of science and professors for leading institutes of mining engineering, in Russia. Mining engineers who have graduated from MSMU are working in all the regions of Russia and 66 countries in all the continents. Moscow State Mining University is located in the centre of Moscow, and is a beautiful historical and cultural place. Several new, eight storey buildings of the University contain more than 70,000 square metres of teaching facilities, and research laboratories are located on a 18,000 square meter area. The University has one of the most comprehensive libraries in Russia and a unique geological museum with a rich mineralogical collection. It publishes about 1,000 journals annualy. information science and computer engineering. MSMU runs preparation courses on any specialty on the preparatory faculty. Native languages learn Russian together in international classes. Foreign students are focused on specific vocabulary and improve knowledge obtained in secondary schools in their home countries. Russian educational system is famous for excellence in education, especially in fundamental and natural sciences, such as mathematics, physics, chemistry, biology. Nowhere else a foreign student is given an opportunity to obtain knowledge in these fields which are necessary for future academic success. Gradually with enriching of vocabulary a foreign student starts learning subjects of basic courses. Upon completion of preparatory faculty course a foreign student passes graduation test of Russian language and his admission to basic courses of the chosen university is arranged. Those who want to continue studies on Bachelor or Master degree programs at MSMU are granted admission to the University. MSMU provides dormitory accommodation for foreign students. Dormitories are located in a pleasant district where foreign students feel comfort and safe located within 15 minutes from campus. Students are provided with single or shared room in a modern apartment building with all the necessary facilities: laundry, kitchen etc. If you like to see Moscow, to visit Moscow and other countries, to hear live Russian speech, we invite you to attend the International Courses of Russian Language. We offer you from 4 to 24 week Russian language programmes. · Programme 1. "Elementary course of Russian". · Programme 2. "A practical course of Russian speech" - "Survival Russian". · Programme 3. "A correctional course of grammar/vocabulary". · Programme 4. "Intensive course of practical speech". · Programme 5. "Difficult aspects of Russian grammar". · Programme 6. "Russian for Business" - business language, professional business relations, business documents etc. Classes are held 5 days a week. The total quantity of practical Russian language is 20 classes a week. Certificate of The Moscow State Mining University of Russian course - Certificate of High level preparation is given on completion of courses. I want to know the applying procedure for the M.Eng courses on Mining and Underground Construction Engineering in a Russian University. Are there any procedure for applying a full Scholar on this M.Eng course ? I am Derek Lavoe from Ghana. A high school graduate (undergraduate). I would like to know how to apply for the skul. the requirement u should have before you can get there. al i will like to if a can apply for a scholarship. Note that i'm a state Engineer in the Mining and Geophysics since 2006. - Registration and Existing programs. I currently hold an BEng Mining Engineering degree from the University of Pretoria and I would like to enroll for an MEng in mining engineering. I would like to inquire about: Admission, scholarships available and the programs available. I am Vinod Saraswat, passed my diploma in Mining & Mine Surveying (3 years Regular course) from Government Mining Institute, Dhanbad-India in 1987 (1988) with 1st division and secured 68.2% marks. I have 26+ years working experience in mining industry and worked in various capacities. Presently I am working with M/s. Orient Abrasives Limited, Porbandar-Gujarat (India) in the capacity of General Manager-Mines since June 2008. Now I would like to obtained DEGREE in Mining Engineering because after completion of Graduation, I will be able to go higher position in other mining organization within India or abroad. 01. How can I enrol myself in Degree course in Mining Engineering (B.Tech/B.E in Mining Engineering)? 02. May I get an admission in IIIrd Semester/IInd year being a diploma engineer? 03. What will be the procedure for an admission? 04. What will be the tuition fees semester wise/year wise/full course? 05. To whom I have to make contact for an admission? 06. What relaxation will you give me because I am working profession? In same respect, I would like to request you kindly guide me and please help me to have an admission in B.E/B.Tech in Mining Engineering in your repute institute. For your kind information, I am keen interested to obtain my graduation in Mining Engineering because it helps me lot in my forth coming professional career. What Should I Do Next For Applying this Course?Which Entrance Exam and When Is It Taken? Hello, I am Hezer Raoul student in 3rd year in Cameroon field 'Mining engineering' I would like to access the master course in your establishment. what are the requirements for admission to your school in order to continue my studies in a similar field? Thank you!